The airspace in 2013 is more complicated with numerous areas being controlled airspace and others classed as either restricted or danger areas. 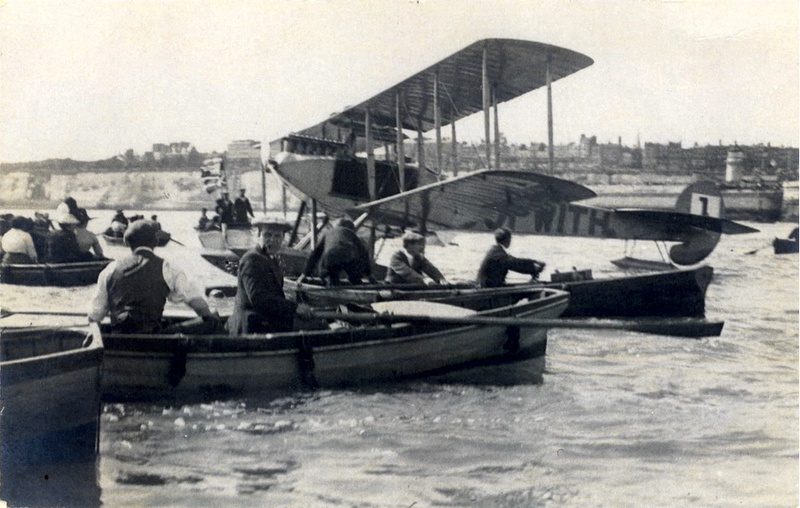 However, the Crew of Catalina G-PBYA intends to follow as closely as possible the 1913 route. To celebrate the Centenary, air displays by the IWM Duxford based Catalina are planned for each of the control points. The route is approximately 1600 miles and in 1913 the two Harrys were time limited. The commemorative flight is planned over 5 rather than 3 days. 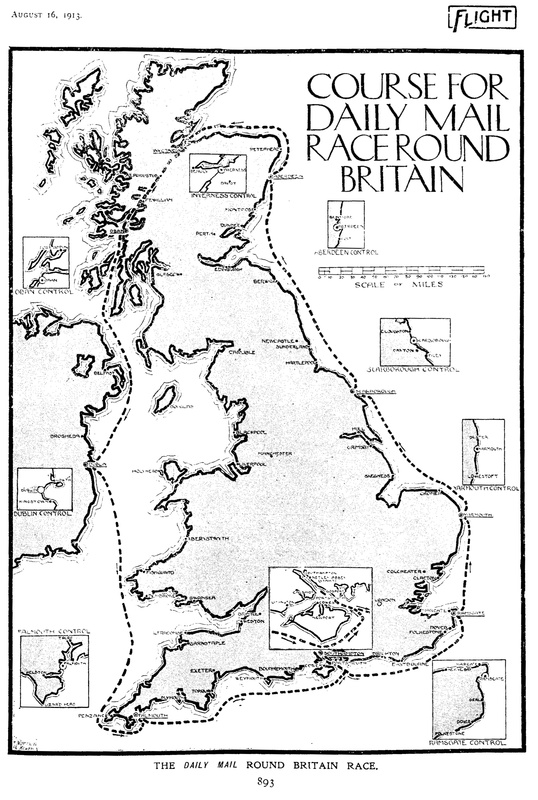 The 1913 Circuit of Britain race had eight Control Points made up of a mixture of hotels, Naval Air Stations and yacht clubs. Fast forward 100 years and some are still in existence! The IWM Duxford based Catalina G-PBYA of Plane Sailing Air Displays Ltd will be flying past all the control points. For those on the ground there will be an opportunity to see the Catalina perform an aerial display at those Control Point locations. The 2013 Route with dates and timings is at the end of this page. Naturally, it is all subject to weather and air traffic control (ATC). This control point was visited twice in 1913. 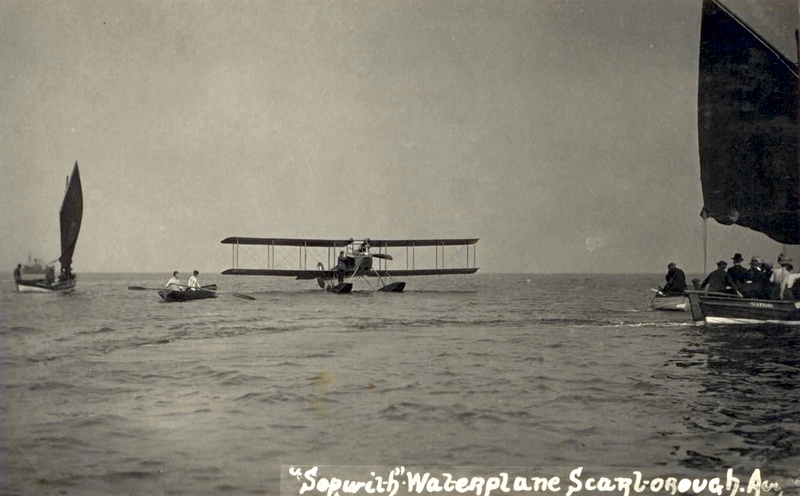 The first visit was on August 19th during the initial attempt at the Circuit of Britain which ended with pilot exhaustion plus engine problems at Yarmouth. 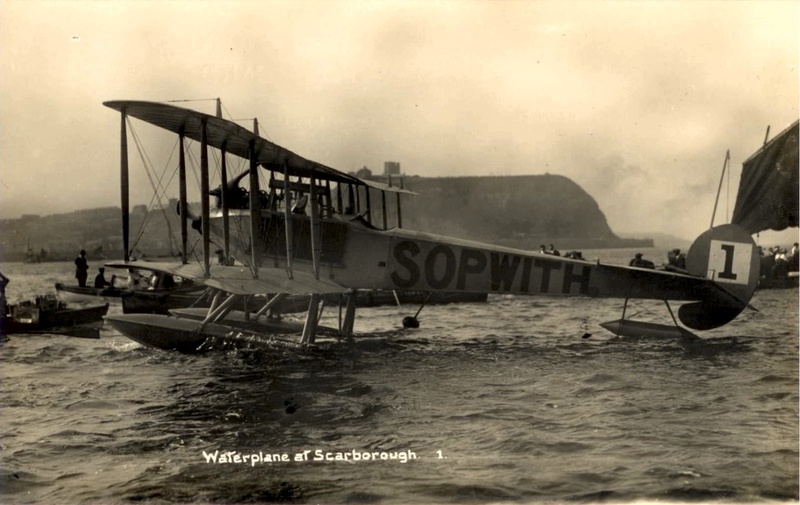 The second attempt was on August 25th and this was more successful with the aircraft continuing its epic journey which was the longest over water. The two Harrys came ashore at Gorleston-on-Sea which is just south of the mouth of the River Yare. The Naval Air Station was north of the river entrance which is now the site of the Port Authority. This photograph (supplied by the Norfolk County Council Library and Information Service) was taken outside the Pier Hotel facing south along the beach. The crowds not to mention the beach huts indicate it was suitable bathing weather. The beach and the esplanade behind will be the best site to see the display by the IWM Duxford based Catalina G-PBYA. In the 1880’s the largest hotel in Europe was to be found in Scarborough and The Grand Hotel is still in existence. It may have seen better days but it still has a commanding position overlooking South Bay. Standing on the terrace of The Grand Hotel or a position anywhere along the Esplanade will give interested persons an excellent viewing point as the Catalina undertakes its display. May the sea be as calm as that in the photographs. Another commanding position will be on Castle Hill seen in the photograph below. This no longer exists having been destroyed by a non war related fire in 1944. Six members of the staff perished in the fire and these days the site is now occupied by a grey concrete hotel! 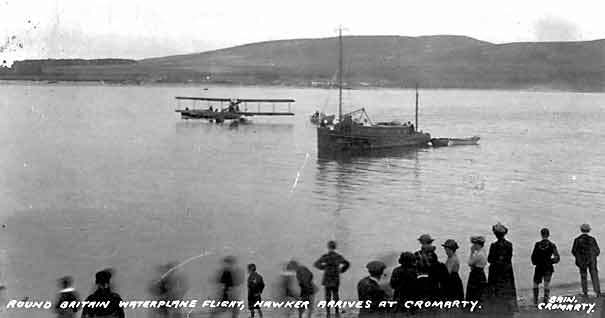 This picture from the Cromarty Picture Archive is taken from the Naval Air Station looking across the Cromarty Firth. The Nigg Ferry operates across the Firth just to the left in the picture. 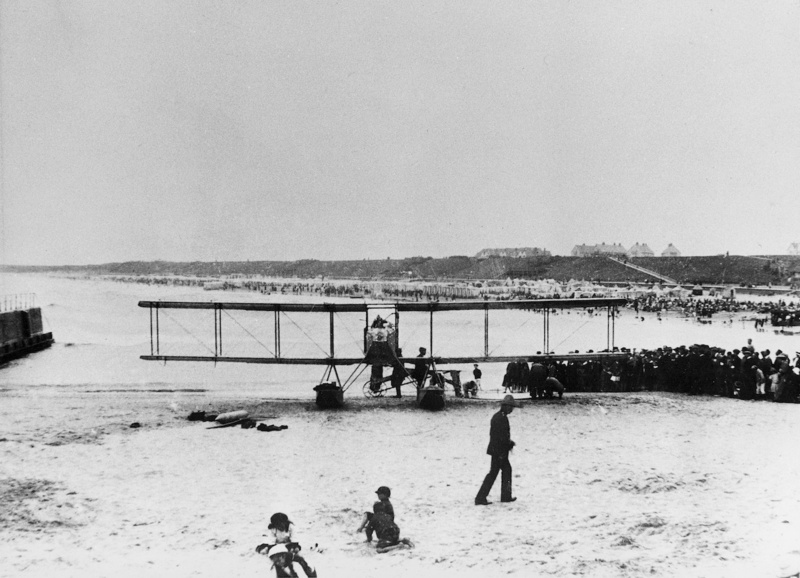 Nothing remains of the Naval Air Station being a tent encampment in 1913. Lieut. 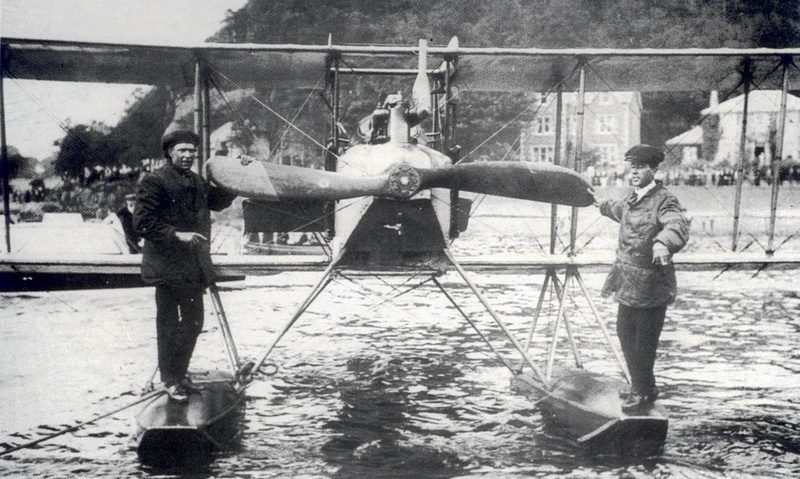 Longmore, an early pioneering naval aviator, was most likely the person responsible for the Sopwith Waterplane coming here rather than nearby Inverness. Harry Hawker is seen standing on the port float (right side of the photograph) with Harry Kauper on the other float. There were problems in Oban with a water-logged float. In the background of the photograph is the current day Barriemore Hotel where the crew of G-PBYA will be staying two nights. This “rest stop” is to facilitate the air display and the opportunity for the public to inspect the aircraft. Oban was a base for Catalinas during WW2 and a number of hotels have on display photographs from that time. The Great Western Hotel still exists and has a number of photographs on display. It is located further along the road towards the centre of the town. Follow the road in front of the hotel in the opposite direction and it ends at Ganavan where there is a RAF Memorial to Coastal Command. Other relics from WW2 still exist and the local cemetery reminds visitors of the human cost. Alas the two Harrys never made it to this control point having crashed just to the north at Loughshinny. The engine of the aircraft was salvaged and used in an Admiralty aircraft but the rest of the aircraft was destroyed. However, the Royal St George Yacht Club still exists at Dun Laoghaire. Today, it is a very busy marina plus ferry terminal so careful thought is being given to where best to undertake an aerial display. This could be just to the south. This too was not visited for obvious reasons. These days the estuary is extremely busy with many yachts and pleasure craft. The Royal Cornwall Yacht Club still exists and has a commanding position overlooking all the marine activity. However, for reasons of safety an aerial display over the sea to the south-west of Pendennis Castle between Pendennis Point and Pennance Point is being planned. Once again it will allow the public to have an excellent view of the IWM Duxford based Catalina G-PBYA of Plane Sailing Air Displays Ltd in action.